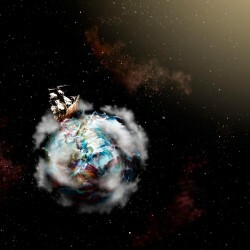 Circa Survive is an alternative band from Philadelphia whose music has consisted of some of the most fun in recent memory. Violent Waves is the band's fourth album and like the rest, it consists of what seems like very basic, hard rock structures but it's everything but. Prior to this album, Circa Survive released On Letting Go in 2007 and Blue Sky Noise in 2010, both of which were strong candidates for my top 20 lists of each, respectable year. The albums had an amazingly strong presence of electric guitar and drums while singer/songwriter Anthony Green sings with the most distinct voice in all of music. His lyrics are also incredibly strong as we get these very depressing pieces of poetry but they also hint at a light at the end of the road which brings a sense of hope to someone at the end of his rope. Safe to say that I have been in love with the themes and ideas that Green and company have explored. Violent Waves is interesting in that the band decided to self-release the record even after having moved to a major label with Atlantic Records just two short years ago. The independent release gave the band a sense of freedom which really shows its presence on this record. 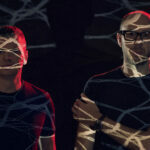 The album goes back to the band's roots and shows a strong resemblance to their debut record, Juturna. On that album, the band were just trying to break out of their shell and exploring a more hard punk style of play. Violent Waves follows suit as complex guitar patterns are left aside for more rhythmic chord progressions yet somehow the songs stay very abstract instrumentally. Drummer Steve Clifford has never been better than he is on this album as he continues to keep most of the musical focus centered on his intense drum patterns. Violent Waves also shows a move towards a more progressive influence and although the change in style is an experimental one, the music lacks the hooks that really gave Circa Survive such a strong identity in the first place. I think this album is a positive step in their musical careers but the material just doesn't outdo their prior two albums. P.S. 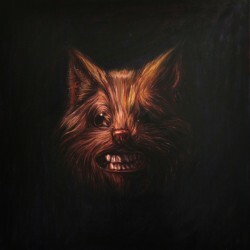 Is there a better album cover artist then Esao Andrews? The answer is no way. Usually, music careers do not last a tremendous amount of time. Bands normally will record original material for a decent period of years but things happen. Band members grow distant, taste changes, inspiration evolves. Of course some bands continue to tour the world and play live shows for people until they drop dead but it's very rare. Swans have been a genius, experimental rock band since 1983. If you've never at least heard of them, then it's probably time to do some homework as they have morphed into one of the most inspirational experimental bands to have ever recorded a piece of music. Over the years, the band released countless records, all of which were consistently brilliant. In 1998, frontman Michael Gira and company decided to call it quits. They thought they had reached a plateau that they could ever escalate above and maybe it was time to try new things. After 12 years though, the band decided to reform and release brand new material. The Seer is the band's third record since the lengthened hiatus and it shows a band that hasn't missed a single step since being separated. This album fuses together elements of very obtuse, experimental rock music and some atmospheric, post-rock ideas that include some rather gorgeous drone characteristics. The ambient qualities that are present on this album really define a new chapter in the musical career for this group and it gives the band a new, more fresh identity. The dark and ominous storytelling behind the dreary instrumentation on this record is both disturbing and genuinely haunting. These aspects really closely relate to an album such as F♯ A♯ ∞ by Godspeed You! Black Emperor which is quite an accomplishment. This record is probably the most expertly crafted album of 2012 and even though it's incredibly intricate and extensively long (over 2 full hours! ), the record still plays out at a terrific pace which ends up being madly enjoyable. 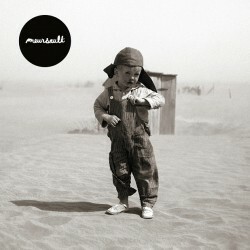 I came across Meursault in 2010 with their sophomore release, All Creatures Will Make Merry. On that record, this Scottish, indie rock band implemented a rather nice folk styled sound into a much more diverse arranged full band sound. The music wasn't earth shattering but frontman Neil Pennycook showed some terrific lyrical ideas. His sense of storytelling and metaphorical songwriting ideas gave this band a true sense of maturity even as they were only on their second album. Something For The Weakened is the band's third full length record and even though the band shows sense of growth, their is still great room for improvement. Once again, Pennycook's songwriting is well crafted and although it's more simplified than his other records, the poetry on these albums is a true standout. Musically, this album falls a little bit flat for me as the acoustic guitars get muddled behind some overwhelming electric guitar and dull drums. At times, this band reminds me a lot of Frightened Rabbit but at others they just can't seem to get on the same page instrumentally. Meursault continues to progress though as they brush some of the rookie cobwebs off their shoulders and lead themselves into more significant indie waters. Australia has really owned the indie rock scene throughout this entire year. It seems like just about every single week I have at least one mini review for a band with roots in the country. Alpine is yet another young band from Melbourne who makes some very melodic pop music. 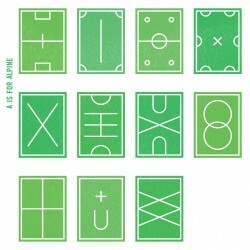 The six piece band has just released their debut LP entitled very boringly A Is For Alpine and the record oozes with premature confidence unlike most debuts. The songs are all built around very subtle guitar driven pop songs with some ethereal qualities pumped into the sound with airy vocals and some elegantly arranged electronics. Each song employs a nice, dance driven emotion and it's impossible to not get these songs locked up inside your brain for a while. I think Alpine is a very surprisingly decent band and it will be interesting to see how this band progresses into their sophomore release. 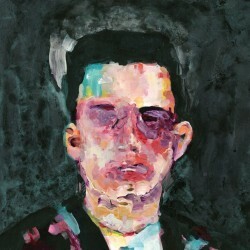 Beams is the fifth LP from the sophisticated electronics musician, Matthew Dear. Dear has been contributing his expertise behind the IDM genre since about 2003 with the release of his debut album, Leave Luck To Heaven. 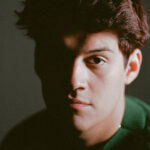 Since then, Dear has really progressed to some more experimental song structures but he has always kept his highly accessible electronic pop music as his basic guideline for song crafting. 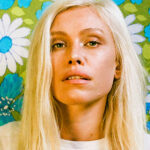 Beams keeps up with Dear's basic influences but strays more towards a balearic beat structured album. The additions of some worldly drum patterns and some jungle driven beats really shine brightly on this record. The pop influences never dissipate though as each song revolves around some edgy pop rhythms which when mixed with the complex electronic arrangements end up creating a very unique sound. All in all though, I've become rather disengaged by Dear's sound which to me, doesn't seem to evolve all that much from album to album. When I go back to a record of his like Asa Breed, his music seems new and wonderfully original but now, the elements within his beat making seem very unimaginative. In the end, you really have to respect an artist like Dear but this album is just borderline forgettable to me. 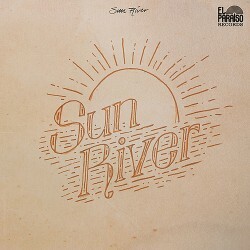 Sun River is a new band made up of frontman Martin Rude, Jonas Munk, and Jakob Skøtt. Their self titled debut has been in the creation period for quite some time now as the members have been working on other projects in the mean time but the material is quite satisfying as far as folk music goes. The content of this record is a hybrid of west coast psychedelic music and 60's folk tunes and although the band really accomplishes this sound pretty well, it doesn't have a very identifiable personality beyond something that has already been created before. I really enjoy the acoustic guitars on this record as everything sounds so crisp and clean while also sounding very lo-fi. It reminds me of being around a large campfire late at night sometime in the late fall as the leaves change colors and the air becomes thick with moisture. This album is very prone to a certain type of emotion and I think the lack of experimenting with anything that is more modern kind of hurts the band. Although it's fun to reminisce, this album does grow dusty before the end of the record is reached. It's been a very emotional journey for The Black Swans, a country/folk band from Ohio. Their career has been littered with tragedy and still they continue to push on. By far, the most severe tragedy for this band has got to be the death of founding member Noel Sayre in 2008. Sayre had suffered a massive heart attack and succumbed to drowning in a nearby pool. 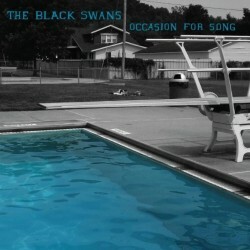 That pool is actually the album cover image for The Black Swans' newest album, Occasion For Song. Although this album is not the first since the tragic death of Sayre, it seems to represent a belated mourning period for the band members. The songs are all filled with morose melodies on acoustic guitar and organ and each lyric is very carefully written with such broken heart sensitivity. The sadness this album presents is very real and tearful and I really commend a band that is able to present their true emotions to us as listeners. These very personal moments are shared with us with such heart shattering distress that it ultimately affects me as a listener. This album will take a lot of emotional energy to get through but if you can, it is highly rewarding. 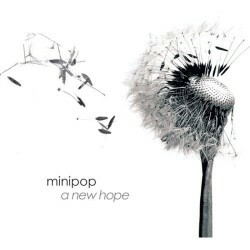 Minipop are the perfect example of what dream pop music is. Led by vocalist Tricia Kanne, their music is a very airy and atmospheric blend of pop enhanced melodies. Kanne's vocals add this tremendously gorgeous and distinct quality to an already elegant sound. If you are familiar with The Sundays at all, Minipop is basically the equivalent to them only in the 2010's. The band has only released a few records since their debut A New Hope in 2007. On that record, the band showed a genuinely beautiful touch of dream pop music and although it's nothing as complex as Beach House, it still employs a very splendid dynamic of how dream pop should be created. Although Minipop's songs don't come across as anything too cerebral or terribly genius, their music is especially beautiful within the genre itself and it's hard to not give a band like this credit for making such melodic tunes. The Soil & The Sun – What Wonder Is This Universe! After a great week of album listens, I am more than ready to start another. If anyone is interested in purchasing or simply hearing any of these albums online, I have linked them for you at the top of this page to make it simple. I hope you have enjoyed reading this weeks edition of Straight From The Teet and I look forward to bringing you a new group of records next week. Please leave comments here at the bottom and let me know what you liked or didn't like from this week's lineup. Have a great week and please support these terrific bands! I'm really diggin this Straight From the Teet feature, I'm what most would consider a Hip Hop head at heart but my musical taste spans ALL genres and this really gives me more of a reason to keep expanding my musical horizons. thanks for the kind words I'm just glad I can help out bringing you new music every week. If you ever have a recommendation please let me know! Lane 8 teams up with Matthew Dear on "Undercover"